MindManager Pro 6 is a seriously cool, highly complex program. By the time I could learn enough about it to write a thorough evaluation of everything this program does, Mindjet would be selling Version 7. And with only 800 words for this review, I'd better stick to how I got interested in MindManager and why it works for my particular home-based business. I first heard about MindManager when transcribing some interviews Mindjet was conducting with customers at large corporations and universities. They were uniformly enthusiastic about the ability to record and arrange brainstorming sessions and to create a visual representation of ideas. MindManager users reported that everyone who saw the mind maps for the first time was awed: "They could now see their entire business laid out in front of them that had always been fragmented in their heads." So I knew before ever seeing it that MindManager was a great tool to use in large organizations for running workshops and project management. Its appeal to me as a small business owner (a sole proprietor) was the ability to collect, display, and organize non-linear ideas. In examining MindManager Pro 6 for this review, I've discovered even more possible uses. It's hard to tear myself away from exploring the software to finish reviewing it, but I'll try to highlight a few of the new features in version 6 and wrap up. 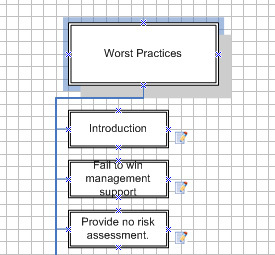 So far, using MindManager Pro 6 I have created the closest thing I've ever had to a business plan. 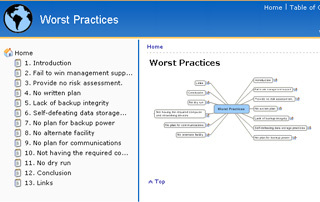 I used MindManager Pro 6 to write this morning's FileSlingerTM Backup Reminder newsletter, "Worst Practices for Backup and Recovery," which I've used as the source of the screen shots. This was easy to do. I just entered the subheadings as topics and wrote the text in the notes field, then rearranged as necessary using the outline view. Because this is my first serious experience with MindManager Pro, I can't tell you how version 6 compares to earlier versions. I do have a handy Reviewer's Guide which highlights the new features, however, and I can certainly attest that they're nice features. (Well, I don't have a Tablet PC, so I can't test MindManager in pen mode, but I can see how well pen mode fits in with typical brainstorming and meetings). Although the included map templates provide several options to get you started, it's worth checking out the online map library, which has maps for special functions such as Six Sigma, Balanced Scorecard, Salesforce.com, and Open Activities, not to mention event planning, resume design, and various applications for students. Mindjet has expanded the integration of MindManager Pro 6 with Microsoft Office. When I open Microsoft Word, Outlook, or Excel, there's a little MindManager icon in the toolbar. The tool tip in Word says "Send selected paragraphs to Mindjet MindManager." 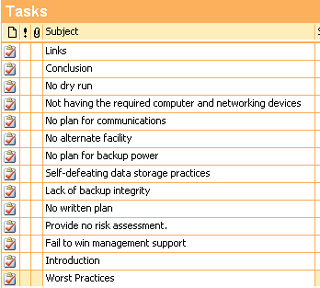 From Excel, you can copy a range of cell data and paste it into a MindManager topic. After that, the MindManager map display will update whenever you update the Excel spreadsheet. From Outlook, you can copy e-mail messages, tasks, etc., over to MindManager (but don't be surprised if Outlook pops up one of those "an outside program is trying to use Outlook" messages when you do). 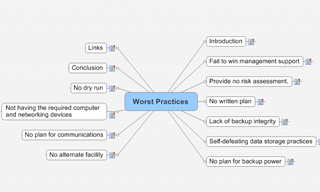 So far, there's no option to import a Visio drawing as a mind map. MindManager Pro 6 will export to Visio just fine, as well as a variety of other formats. A small series of buttons at the bottom right of the MindManager screen provides export options. You can export your map as a PDF (and the PDF-Xchange driver is much faster than Adobe Acrobat), as a web page (with a multitude of single page, multi-page, image-only, and text-only options), as a series of Outlook tasks, as a Word doc, and as a PowerPoint presentation. The new Attachments feature means you can use your mind map as a master document. With the site map, for instance, I could attach each web page to its map topic, and also attach any additional copy I'd written or images I wanted to include. That makes a Mind Manager web site redesign map much more useful than the Visio site map I had before. The only thing not to like about Mindjet's MindManager Pro 6 is the fact that it disables Acrobat's "Convert to Adobe PDF" contextual menu/toolbar feature. Since it doesn't interfere with the Acrobat printer driver, this is only a minor irritation. MindManager installs Tracker Software's PDF-Xchange 3.0, and I'm betting that's the source of the difficulty. The PowerPoint export previews the slides inside MindManager, though it also gives me "Runtime Error '91'" messages while doing so. Finally, as an exponent of new media I want to applaud Mindjet for including an RSS reader in MindManager 6. I have three blogs associated with my two web sites, and I can actually include the most recent posts from those feeds in the map. If I had to describe my reaction to MindManager 6 Pro in one word, it would be enthralled. And I've hardly gotten started.